Beloved and I had afterbrunch, or perhaps more of a brinner (dinner as breakfast, coined by me), at Hot Star’s somewhat newly-opened Katipunan Branch. It’s not actually at Katipunan itself, but on one of the side roads, F. dela Rosa to be precise. From the title, you can probably assume what it serves: Large Fried Chicken. Now, I’m not virgin to this place. Our office had lunch here the day before, and I’ve seen how Large their Fried Chicken was. I didn’t order their chicken and rice combo, however, and instead opted for their chicken sandwich. While hefty, it wasn’t as huge as the chicken that came with their rice meals. 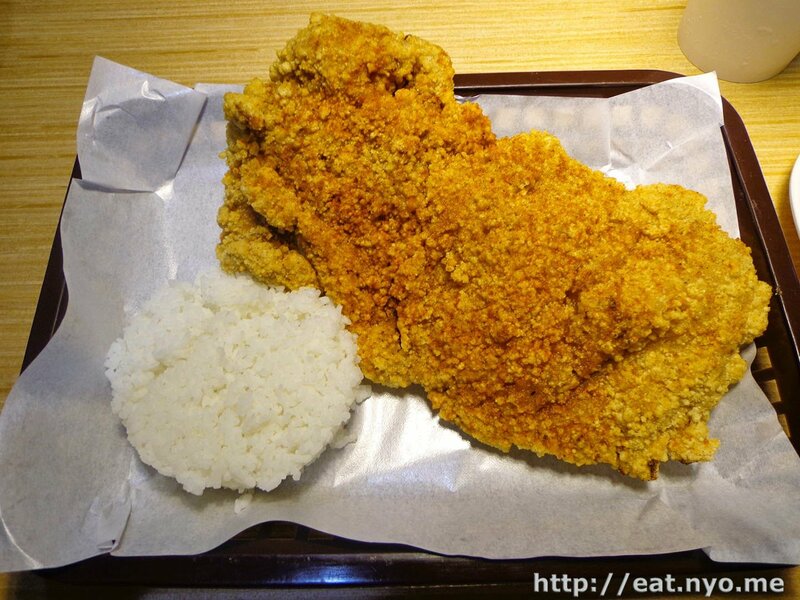 Anyway, they offer four kinds of “Large Fried” meals, named simply “HS” followed by a number. Beloved ordered their HS1 which was their Original Fried Chicken for 110 Php. To this she added 35 Php for rice and drinks and additional 10 Php to upsize said drink. I ordered their HS4 which was their Large Crispy Fish, also for 110 Php. Instead of adding rice and drinks to mine, I also ordered their French Fries (60 Php) and had their Combination Ice Crush (45 Php) for drinks. Pictured above is their HS1 with rice. Yes, that’s a cup of rice. Yes, it’s definitely a large fried chicken. I believe they took an entire half of chicken minus the legs, some of the thighs, and wings. The reason it’s that big is because they butterflied the breast and pounded it almost straight before battering up and frying. Now, this was good for Beloved because she doesn’t eat chicken skin, and this dish didn’t have the skin on it, only batter and lots of chicken meat. How was it? Well, it tastes like… chicken. There’s not plenty of flavors working here outside (or perhaps more appropriately, inside?) the batter. The only unusual thing about is was the size, or, more accurately, the presentation. Although it was quite large, larger than my palm, the size was more of a surface area trick. Beloved easily downed this dish while craving for more. Well, I did help a bit since we shared both dishes. 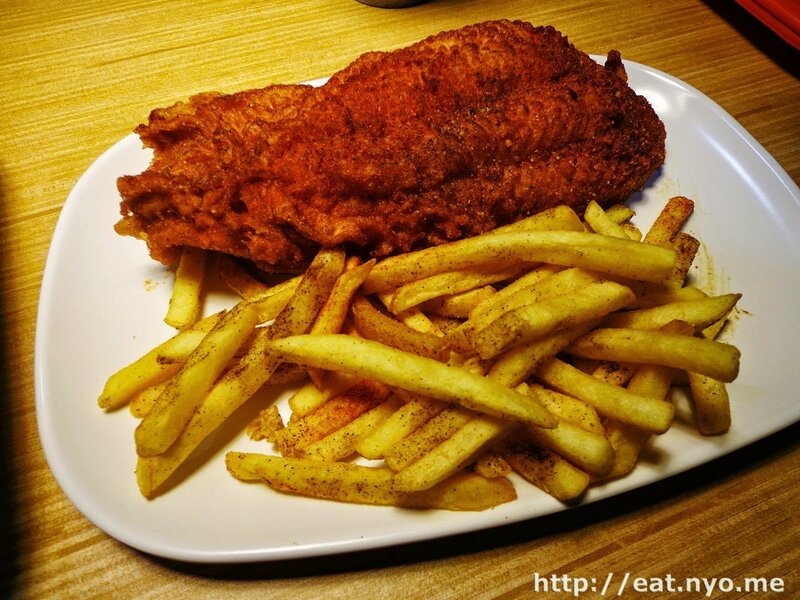 Speaking of, my HS4 was also a large cut of fish, cream dory I believe, similarly battered and fried. Although the French Fries came in a paper container, I opted to put it with my fish because it looked lonely without any carbs. Anyway, this wasn’t flattened out like the chicken, but if you had to weigh it, I believe they would be roughly the same. Since we were more fish lovers than chicken lovers, we liked this moist fried offering over the chicken. Their French Fries were okay, crisp and fluffy on the inside. I sort of ruined it because I asked this to be spicy and they just slathered it with cayenne and black pepper. I would’ve preferred it with a bit less. One big thing that we both agree and enjoyed here was the fact that they serve unlimited rice gravy. Why it’s called “rice gravy” I’m unsure, but it tasted pretty good with both chicken and fish, and even the rice and fries. I guess I should also write about my Combination Ice Crush. This is more of a liquid dessert than a drink. The top white part was an almond concoction and the lower part was black gulaman. The almond part has that strong flavor of almond extract. The lower part was also distinctively what you would expect gulaman would taste like. Both of them were served in a nice slushy consistency. But, if you want your thirst to be quenched, I’ll recommend having their upsized drink, or water, over this more-of-a-dessert one. Overall, it was just okay. I guess Beloved and I were expecting more because their dishes really were large. But I guess large doesn’t equate to full. Yes, we didn’t get full. Now, disclaimer, I cannot speak for normal people because apparently our appetites aren’t normal according to friends. Maybe you will be sated with these large offerings. Looking back, I guess it’s not bad for 110+ Php. These are definitely competitive prices, especially for the large student demographic in the area. 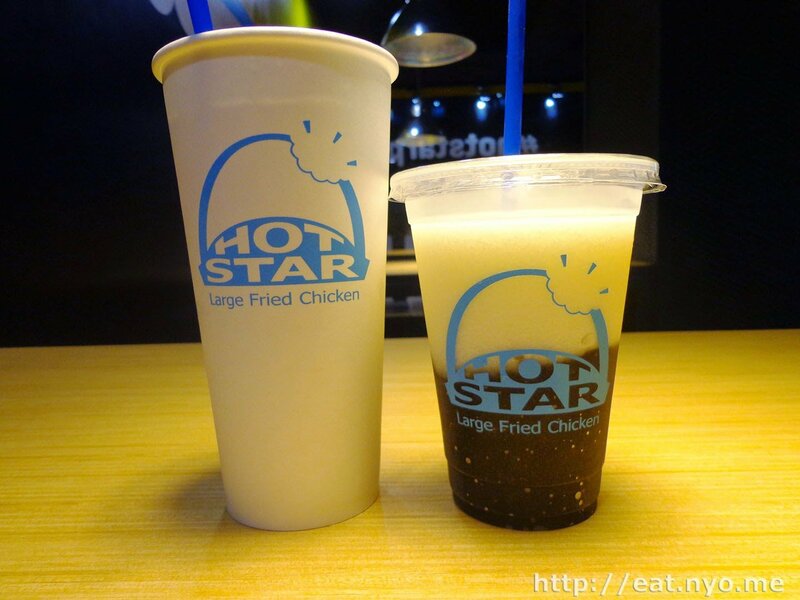 Anyway, we easily downed Hot Star’s Large Fried Chicken and Large Fried Fish with plenty space for dessert or another round. But two rounds of their meals ist’t really viable, not because of the size, but because of their rather cloying property. Yes, the real enemy here is not the size, but the umay. Nevertheless, I guess all things considered, it was definitely worth the try. Recommended for: Gravy lovers. Battered chicken and/or fish lovers. Not recommended for: Those with bigger appetites. Smart nomnomnom tip: Go in a group and order with variety in mind to combat the umay.